First, I'll like to thanks Dimitri @ Musica Acoustics for the samples. 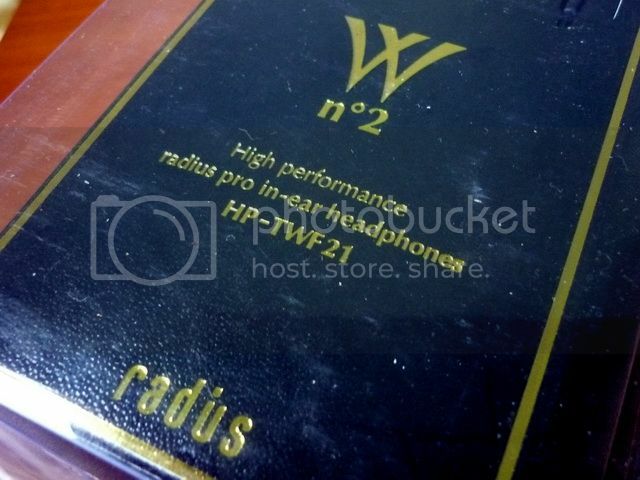 Radius is a company with a long and interesting history (see my original DDM / HP-TWF11 review for more detail). But before the original DDM, they were not really considered as a serious headphone company. In fact, they were almost unheard of outside of Japan and only several of their lower-end, fairly generic earphones could be found in the computer accessories section of a large bookstore. They were much more successful as a PC accessories brand then they ever were an earphones brand. But if there is a tale about one headphone that makes the fame of a company, it isn’t anything more befitting than the release of original DDM for Radius. However, DDM is such a radical sounding and designed IEM that it really isn’t for everyone. This is perhaps why Radius took their ‘Dual Diaphragm Matrix’ dynamic transducer back to the drawing board and developed the new HP-TWF21 “W n°2” (or DDM2, as more commonly referred by the user). 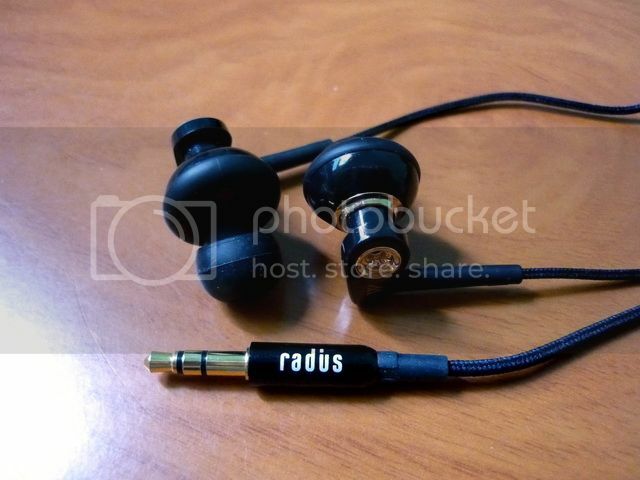 Another Radius IEM that is under review is called the ‘radHeadphones LIVE’ – I am not really sure what ‘rad’ means but it is developed as a specialty IEM that meant to do one thing: That is to inject the sense of live performance into any type of rock music. Yes, rock music only. By the way, do check out the new HP-TWF21’s English site here. Cable: 55cm + 80cm Two piece cable. Cable: 1.2m with nylon fabric sleeve. 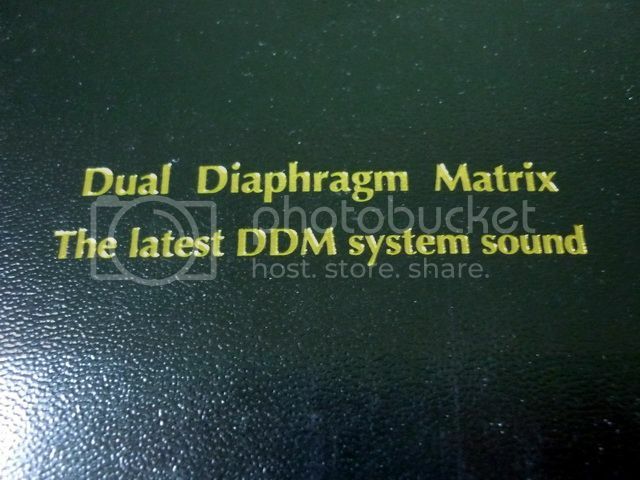 So what is the so called ‘Dual Diaphragm Matrix’? Typical dynamic driver has one diaphragm attached to an electric coil. The coil is usually placed around a rounded magnet. When the electric current (signal) passes through the coil, it forms an electro-magnetic field and is either repelled or attracted by the magnet’s own magnetic field. The movement of the coil (which is dictated by the ever changing signal) causes the diaphragm to vibrate at different rate, which in term causes the air to vibrate and produce sound wave. 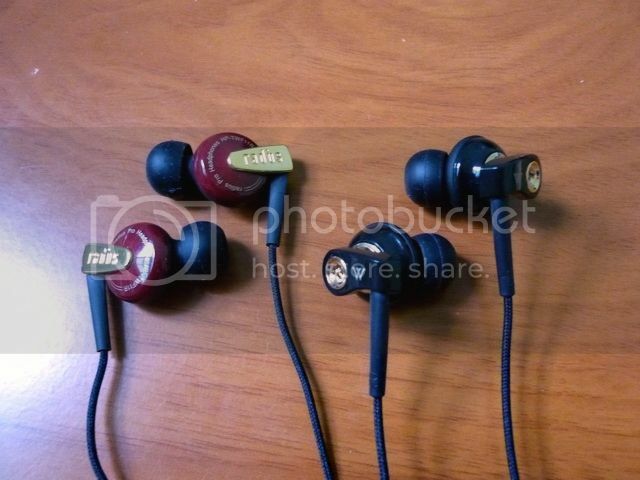 In a typical dual dynamic driver earphone, such as those earbuds invented by Panasonic quite some time ago, there are simply two dynamic drivers with independent diaphragm, coil and magnet. The signal is separated by a crossover and fed into the two drivers, one as tweeter unit while the other as mid/bass driver. 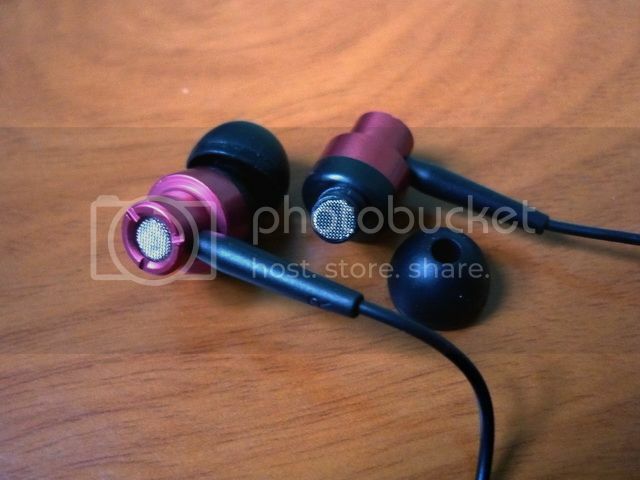 The difference between a typical dual dynamic driver earphone and the DDM is that there is only one magnet in the DDM. The mid/bass driver’s larger coil goes around the outer rim of the magnet while the tweeter unit’s coil fits around the inner rim of the same magnet, with the two diaphragms each facing a different direction and occupied each side of the magnet. The result is a dual dynamic drivers’ setup that have the physical size of only one driver. With this new technology, the Radius HP-TWF11R was born. 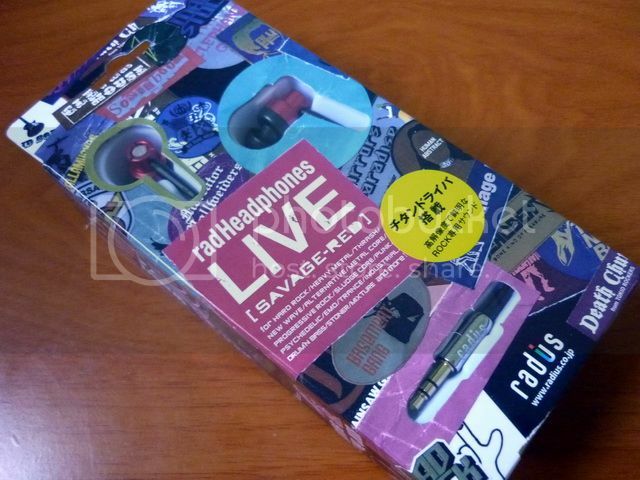 radHeadphone LIVE’s packaging is fairly simple but colorful, really nothing special to take note of. The same can’t be said for DDM2. 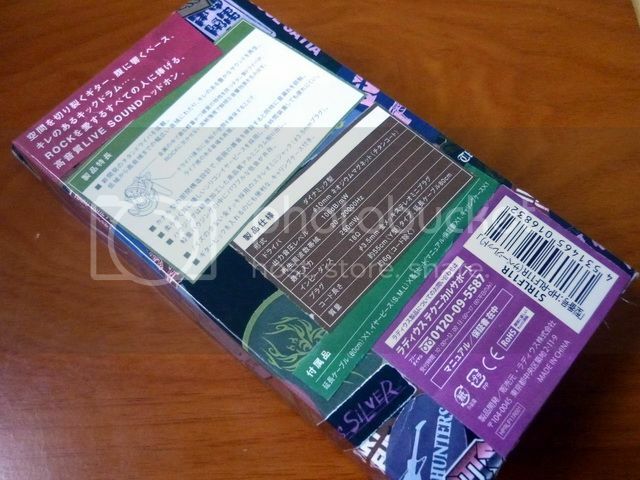 While the packaging has been changed from the original DDM, the same elaborated style remains, and so is using an oversized transparent plastic box over the actual product’s paper box. 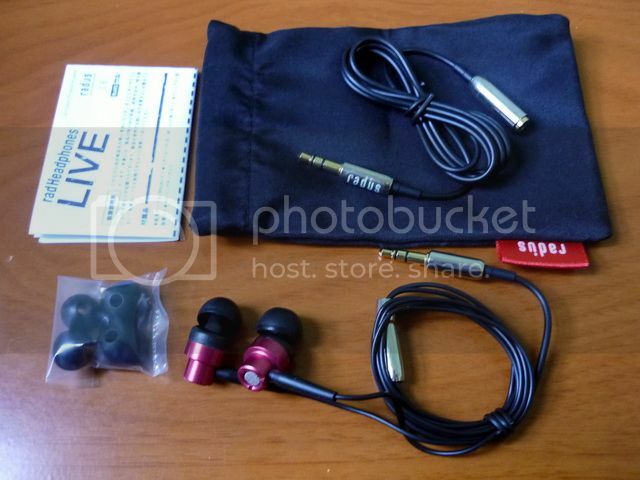 Accessories are decent with radHeadphones LIVE. There are three pairs of single flange eartips (S, M, L) and a soft pouch. While the eartips are decent on their own, the small nozzle opening is limiting the treble response. I will suggest some good old generic single flange with a wide opening. 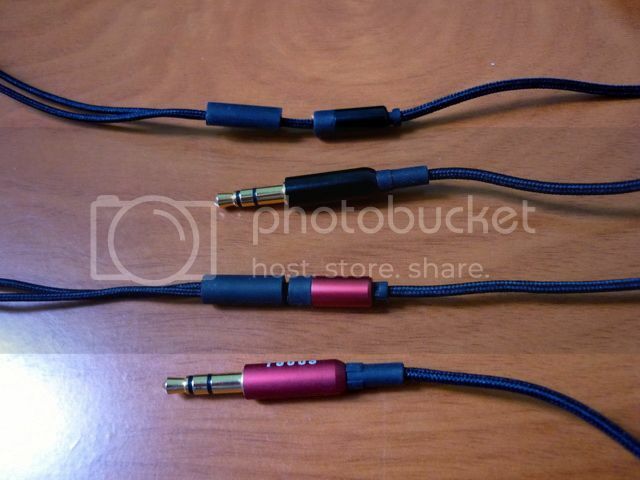 The cable has a two pieces design. Though the connectors are all metal, it is actually not heavy enough to be inconvenient. Build quality wise, it is fairly sold. The cable itself does feel a little thin and flimsy at time, but overall seems to hold together well and surprisingly low in microphonics. 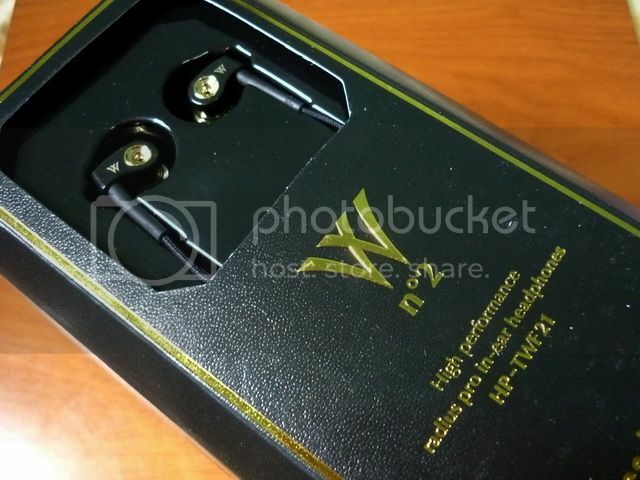 The earpiece is half aluminum and half plastic, and it looks pretty decent. The back vent is actually covered by a piece of metal mesh much like the one on the nozzle. The only part that looks a little worrying is the strain relief. It does its job well but the attaching point into the housing doesn’t seem to be very strong – definitely won’t be a good idea to pull the earpiece out of the ear canal via the strain relief. 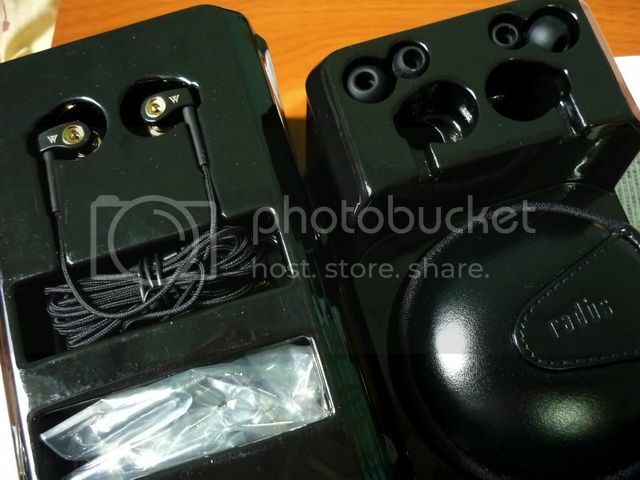 Isolation is a little blow average, as you would expect from an IEM with a vent on the back. On extra note, all of the logo on the metal pieces are painted on and rub off easily. Some permanently lasered logo would be nice. Accessories on the DDM2 are of course much richer. Like the original DDM, the gorgeous looking leather case with an inner silicone cord winder is still included, so are the total of 6 pairs of single flange eartips (S, M, L, 2 pairs each). The only new addition is a right angle cable adapter. The eartips are still the same soft variations which have proven to be not very useful in the old DDM, but they actually works fairly well on the DDM2 because the nozzle position has been changed. The cable is the same as the original DDM - fabric sleeve, not particularly good on microphonics and a little inadequate on strain relief. This is apparently a choice to keep the Japanese users happy as they somehow prefer fabric sleeve over the conventional rubber. 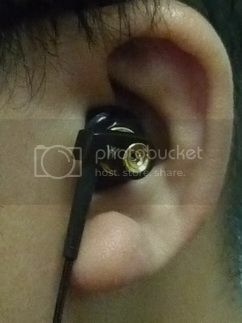 Overall build quality is up to par with the original DDM, but the new design of the earpiece (especially the strain relief) is odd for sure. Radius has gone a long way to solve the ergonomic issue with the original DDM, but it seems to me they might have gone a little too far, or maybe ‘over-elaborated’. But this is not to say the new design doesn’t work, because it does work fairly well. It just not something I would refer as the most elegant of solution. Isolation is perhaps the only part that worsens on the DDM2. The original DDM has never known for good isolation, and the new DDM2 just makes it worst with the addition of vent. It is really more for private listening than for public transport. Overall the two Radius are both above decent in build but by no mean perfect. A big part of Radius W series is the design and it really shows in DDM and DDM2. But beyond the luxury of the gold and black motif, I think a simpler and solider design can be appreciated as well. A comparison between DDM and DDM2. 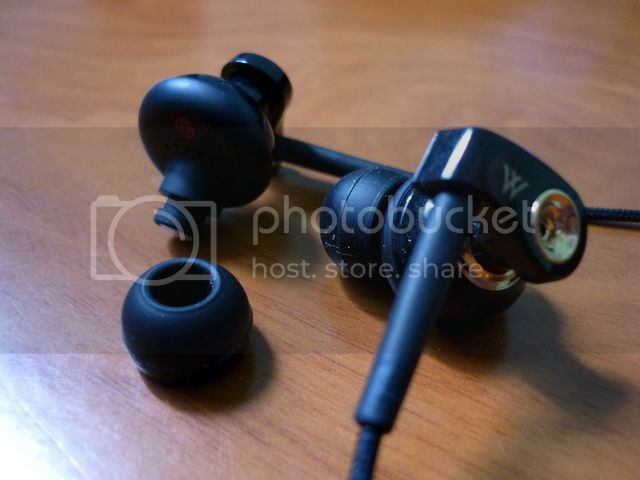 Both IEM have been given at least 50 hours of burn-in before the review. No significant change was detected. This is a little different from DDM which I do feel like the overall frequency was getting smoother after the burn-in. The DDM2 sounded quite ‘normal’ before the burn-in and continue to behave just as good after the burn-in. The transducer on DDM and DDM2 are said to be the same and I guess whatever is making DDM more susceptible to burn-in is tuned down in DDM2 as well. Regardless, a minimum burn-in for most dynamic IEM won’t hurt and that’s what I’ll recommend. The sound signature of radHeadphone LIVE is bass driven, warm and full to a little thick at the lower end smooth with a mild U-shaped at the upper end. Bass is abundant, deep, and of monster level, dominating the rest of the frequency. It might seems boomy on the mid-bass at first but it is actually mostly full swing at the sub-bass that gives it the chest pounding effect without totally smearing the detail. Still, it will take a basshead to fully appreciate that much bass at such low notes. Mid is recessed, placing the vocal a little further away than usual. It gives a sense of space but still feels thick under influence of bass. Treble is crisp but lacks a good amount of top end sparkles. It really accentuates and adds detail to the overall presentation but fail to stand out on its own. Soundstage is immersive but just decent. It feels like you are just a few row of seats away from the singer, but the sub-woofer is preventing you from getting any closer. 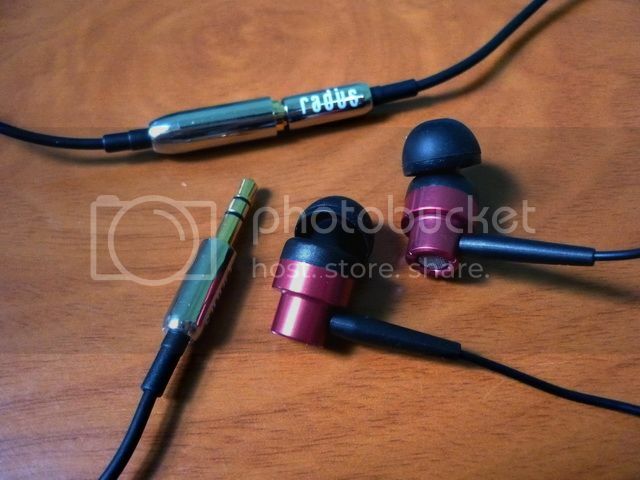 In many ways radHeadphone LIVE reminds me of how Sleek Audio SA6 sounds like in the upper mid and overall treble. With radHeadphone LIVE, it is just a lot more bass and not quite as forwarded enough on the lower to middle mid. 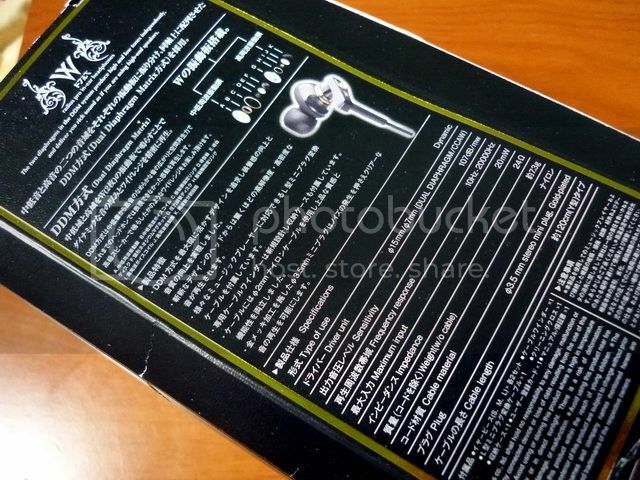 It is not common to find a pair of IEM with recommended pre-defined usage from the manufacturer. With the radHeadphone LIVE, it is to turn any rock recording into live performance, and that includes everything from Hard Rock to Alternative. Not an easy goal if you asked me, but somehow, perhaps just a trick of mind, I do find radHeadphone LIVE’s presentation is able to capture a glance of the feeling, as if I am in the front row seats in a rock concert. The chest pounding bass, the thick note and the big dynamic are what make it feels so close to the action, yet never close enough. This is a very different sounding IEM from DDM (which also sounds very live-like, though more like half a concert hall away), but it recreates the ambiance and emotional aspect of the music almost just as well. Coloration is really the key here, and Radius has done a good job on trying to give it the right flavor. 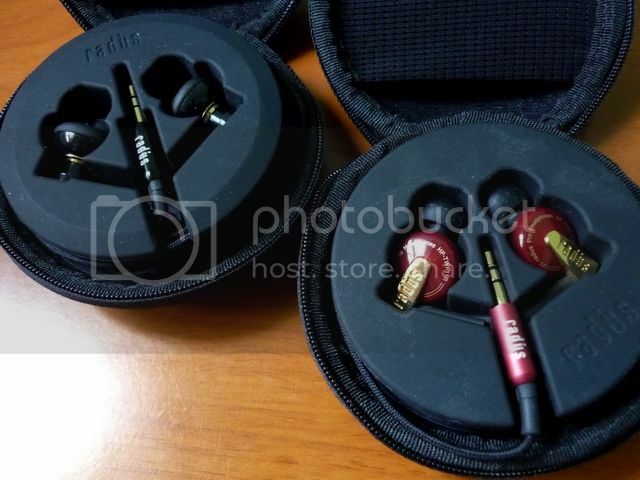 One thing that is certain is where they said the IEM is for rock music only, as I don’t think other genre of music will work very well with radHeadphone LIVE. The sound signature of the original DDM is musical, warm and sweet with a great bass and a smooth top, a little laid back with a very decent soundstage that is more about a good blending that it is on resolution. The DDM2 retains the same sense of musicality but tunes things around - most noticeably it is lusher in presentation. Bass is a little lower in impact compared to the original DDM but it still qualifies as a basshead level IEM. Interestingly enough that it actually has more body/decay than the original DDM, making it sounds fuller and ever so slightly more textured, though also a tad slower. The same fullness also penetrates to the mid. it doesn’t bring the mid more forward in position than the original DDM, rather just ‘fill-in-the-blank’ with lusher tones in the same occupied space. Treble is where DDM2 improved the most over the original DDM, especially on extension. While still a step behinds the mid and bass, it is at least quantitatively enough to bring up some of the micro detail missing from the original DDM and not to appear quite as dark or lacking with string or brass instruments. Soundstage is above decent. While the overall resolution is improved to give better image, the fullness turns the originally open stage to more immersive stage, which I consider as a trade off rather an improvement. I must confess that I really like the original DDM’s sound signature. It is both euphonic and relaxing. May not be technically perfect, but really excels on background listening. DDM2 also has a fairly euphonic presentation, but carries more energy and richness with it and conveys even better timbre than the already good DDM. I think one of the best description about the difference between DDM and DDM2 is, DDM makes you feel like you are sitting in the back half of the classical concert hall, while DDM2 makes you feel like you are sitting in the front half of the same hall. From a purely background listening point of view, I still prefer the more laid back and effortless DDM. But when a grander presentation is called for, DDM2 is perhaps the best choice to showcase what musicality is all about. If there are common traits among different models of Radius IEM, I guess the ability to recreate the ambiance must be top on the list. It seems to be their goal is to maximize pleasure and experience rather than accuracy or any technical perfection. 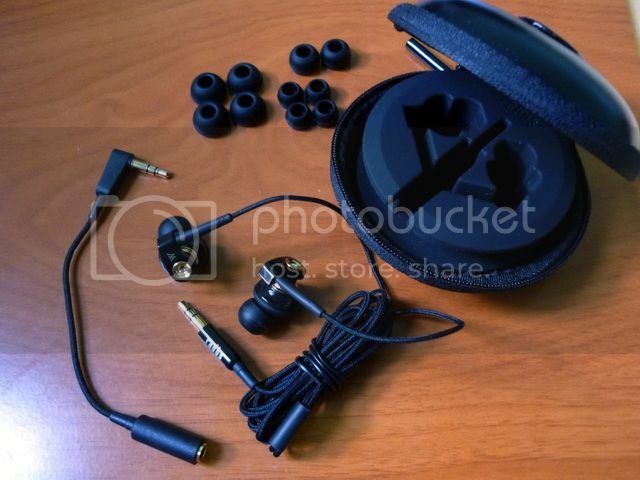 Granted that this kind of tuning might not be suitable for all, it can be very rewarding for those who know what they are looking for something unique and different from the rest of the IEM market. The radHeadphone LIVE at around $80 is pretty decently priced for what it does, but DDM2 MSRP at about US$300 is almost twice as expensive as the original DDM's current street price (US$160, more or less), which makes it a little tougher to swallow, considering that the sound quality improvement isn’t really $100 more and you’ll know where the rule of diminishing return really applies. While not quite as big a bang of bucks as the original DDM (*street price, which is still a very good buy), the DDM2 is far from a bad buy per se – just more in line to other IEM of the same caliber and not quite as competitive as its little sibling. The good news is that, like the original DDM (which MSRP is about US$200), you can expect the street price of DDM2 to be $50 lower than the actual MSRP, which makes it still better in value against most of its competitors. For Head-fi.org member, you can drop Dimitri @ Musica Acoustics an email as he is offering a promo price of US$249 for all forum members. Check out the The List for numeric ranking. [UPDATE 7th June 2011] Musica Acoustics is having a week long sale on the DDM2. Check out more detail here.